This afternoon I attended a promotional cinema screening of the first episode of the new Sherlock series. It's big in China, broadcast on-line on Youku (similar to YouTube) with its first six hours clocking 1.4m hits. The cinema was full of groupies so I thought I'd have a bit of fun. As I walked onstage to give an opening speech in front of the huge image of Cumberbatch & Freeman (right), I put my overcoat on and struck a pose. To my surprise, the audience went wild. Pah, there's nothing to this acting malarkey. 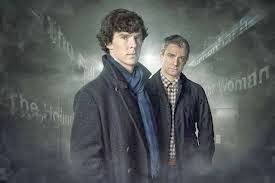 As for the episode: the terrorist plot was completely secondary to the explanation of Holmes's 'death' at the end of Series 2, his parents show up (played, interestingly, by Cumberbatch's real parents, both actors), and the whole thing was fun & stylish with slick production values. The Chinese I speak to are amazed that it's a TV programme. "It looks like a film"